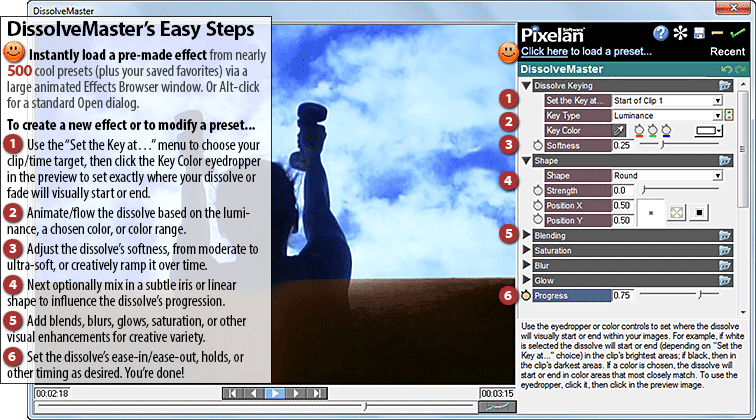 DissolveMaster is a video transitions plugin for Windows, including Windows 10. Sorry, we have no Mac versions currently, but may soon! 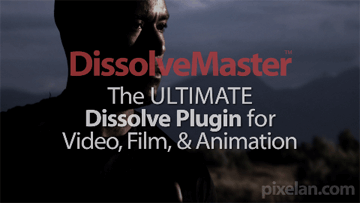 The ULTIMATE Dissolve Transition Plugin for Your Projects! DissolveMaster is an all-new hardware-accelerated video transitions plugin for Adobe Premiere Pro, Premiere Elements, Adobe After Effects, Sony Vegas, Sony Vegas Movie Studio, CyberLink PowerDirector, Magix Movie Edit Pro, and Magix Video Pro. 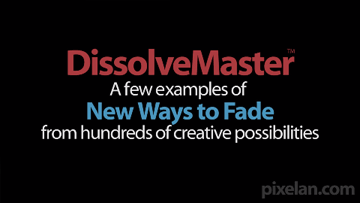 It is the ultimate tool to create dissolves and fades of all types including film dissolves, soft directional dissolves, blur dissolves, glow/flash dissolves and beautiful dissolve transitions never before available. It is a great enhancement even if you are a "cuts and dissolves" editor, providing subtle ways to lead your audience’s eye within a scene using the unobtrusive, clean aesthetic of the dissolve transition. Note: The above image shows interface for Premiere, PowerDirector, Movie Edito Pro, and Video Pro users. The Sony Vegas version has an OFX interface. The After Effects version uses a standard AE effects plugin interface. Choose visually from nearly 500 presets, including your own saved favorite presets. All are customizable. DissolveMaster also includes dozens of powerful "section" presets you can quickly click and mix into hundreds of fresh looks, and a large animated Effects Browser window to easily compare/choose presets and effect variations. Or click its Recent button to instantly access a recently applied effect! If you only watch one movie, see this one. Shows many example custom dissolves and fades, plus DM's ability to organically animate/flow other effects easily. Lots of cool additional examples of how DissolveMaster can organically animate/flow other effects in your video editing program EASILY and QUICKLY. Instead of the usual non-adjustable fade transition, see examples of how to gently emphasize the center of interest, main subject, or action in your scene's fade. 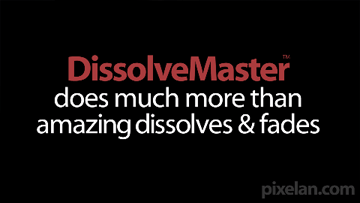 DissolveMaster includes many options to visually enhance its unique dissolves. 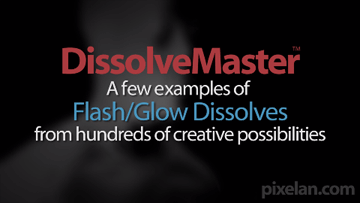 Its flash dissolves and glow dissolves are terrific for unusual or creative videos!